Atherapy: Saeka hits new heights! Saeka and friends hit the top! 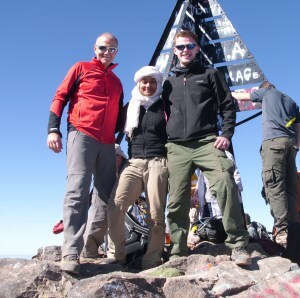 ‘I approached Chris Whittle, Physio at the Tower Hill Virgin Active Health Club after tearing a ligament in my left foot – I wanted to know if I’d be well enough to climb a 4100m mountain in Morocco in June. Having assessed it thoroughly he said that it would be do-able so long as I followed his instructions and I started with simple stretches and icing to help it heal. We met at two week intervals to check progress and Chris would give me additional exercises each time to increase my confidence and range of movement.